What is Biomarker and Pharmacogenomic (PGx) research? A characteristic that is objectively measured and evaluated as an indicator of normal biological processes, pathogenic processes, or pharmacologic response to a therapeutic intervention. A type of biomarker that can be usedto better understand associations between genetic/genomic information and disease andwhy people respond differently to drugs. This research may help scientists understand patientresponse to the study drug or other medications they are taking, or the patient’s disease or medical condition. This research may be influential across all phases of drug development. PGx research focuses on genetic differences that affect the way drugs exert their effects, including adverse events and variable efficacy, or understanding genetic differences of a disease that help us understand variability in response. 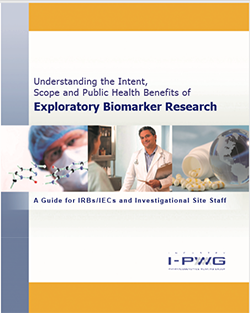 How is Biomarker and PGx research conducted? PROTOCOL AND INFORMED CONSENT: The protocol and consent define parameters such as the research scope, retention period, risks/benefits, and disclosure plan. For clinical trials, information about the research may be found in the main consent document for the trial or in a separate consent form. SAMPLE COLLECTION: Biologic samples are collected from trial participants. Samples are for laboratory research and/or stored for additional analysis if that becomes necessary. LABORATORY RESEARCH: In some circumstances samples are used immediately for planned	research. Other times, samples are stored and used at a later date, as the science evolves, in	accordance with the consent and protocol. DATA ANALYSIS AND DRUG DEVELOPMENT: Results are analyzed using various bioinformatic and statistical tools. Findings may be confirmed using samples from subsequent trials. This exploratory research may lead to the development of better drugs and treatment regimens. Why is Biomarker and PGx research important? It is unlikely that the patients who contribute samples for biomarker/PGx research will see an immediate benefit. However, this research hasthe potential to improve our understanding of how individuals respond to drugs in a population (see examples below) and improve our ability to predict, detect, and monitor diseases. This may ultimately result in clinical decision-making about therapies that are safer and more efficacious. Regulatory agencies have recognized the potential public health benefits of this research and have communicated sample collection and research expectations. Sample sizes that are large enough to represent the study population are needed in order to conduct meaningful research that has a global impact. Regardless, identifying associations between genetic and other biomarkers with disease and drug response can be extremely complex which is why not all research will be successful, but we hope to increases successes as our knowledge and technological capabilities expand. What are some examples of biomarker research in drug discovery and development? Oncology: Studies in metastatic colorectal cancer (mCRC) demonstrated that in patients treated with cetuximab, only those whose tumor expressed EGFR and were K-Ras mutation negative (wild-type) had a benefit. Cetuximab is indicated only for patients with EGFR-expressing K-Ras mutation-negative mCRC. Neurology: Individuals positive for the HLA-B*1502 allele have increased risk for CBZ induced Stevens Johnson syndrome or toxic epidermal necrolysis, which are potentially fatal. While HLA-B*1502 is found almost exclusively in patients with ancestry across broad areas of Asia, other studies in patients of European, Korean, and Japanese ancestry have found a moderate association between CBZ-induced hypersensitivity reactions and HLA-A*3101. Screening is recommended in patients with ancestry in genetically at-risk populations. Cardiology:Poor metabolizers for CYP2C19 treated with clopidogrel at recommended doses exhibit higher cardiovascular event rates following acute coronary syndrome or percutaneous coronary intervention. Tests are available to identify CYP2C19 genotype and can be used as an aid to determine therapeutic strategy. Neurology: Genetic analyses using specimens from a variety of sources, including clinical trial subjects, have identified associations between multiple variants at the BIN1 locus and susceptibility to late-onset Alzheimer’s Disease (LOAD). These new findings potentially nominate or support additional mechanisms and pathways for the pharmacologic treatment of sporadic LOAD. What results may be returned from this research? In general, much of the biomarker and PGxresearch performed by pharmaceutical companies is exploratory in nature. For patients this means results are often of limited immediate clinical value and are generated in laboratories that meet research needs, but do not meet the quality and capability standards needed for use in medical decision making. In addition, due to the length of time that samples are stored and used it is often difficult to re-contact patients. Due to these factors, the majority of biomarker research results are not returned to patients. However, where required by local regulations, or where results are medically relevant and generated in a way that they can be used for medical decision making, these results may be returned to those who are interested. What privacy, confidentiality, and patient rights concerns may pertain to this type of research? Given the risk associated with the inadvertent or intentional disclosure and misuse of genetic information, there is a responsibility to safeguard the privacy of a study participant in accordance with pertinent laws, regulations, standards, and policies. The I-PWG considers single coding as an adequate measure to protect privacy. Genome wide approaches (e.g. whole genome sequencing(WGS), whole exome sequencing (WES), and Genome wide association studies (GWAS)) allow researchers to generate significant amounts of genetic data that are unique to an individual. Single coding provides protection for patient privacy especially when combined with additional safeguards (e.g. storage in a secure location with limited access). Researchers often limit access to the full dataset unless the patient specifically authorizes sharing of this information and understands the risks involved with doing so. Likewise these data should only be studied to answer the specific research scope defined in the consent and protocol without the obligation to “hunt” for additional significant findings that may be contained in the dataset.